I hope yall don't think I'm crazy for the colors I am choosing for my Christmas cards....it's just that this year I wanted my cards to be bold and unusual!!! This one is on that same order as the "red on red" that I just recently posted! It's the unusual that stands out the best. I think this one is just as gorgeous as the red one that you did. Very, very elegant. Are you going to post the starburst cards too ? Pleeeease. What a lovely elegant card. Oh I love those color together. That card is striking. Great job. Yes would love to see the starburst card also. 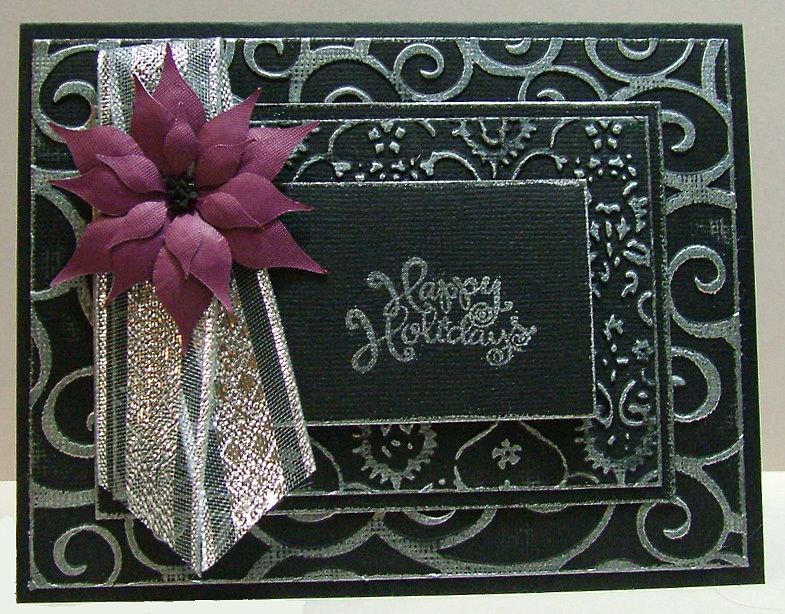 Very nice and I certainly know the challenge of working with black and silver (grey). Oh Pam, that is gorgeous! It's recipient will surely be very pleased! Pam another beauitful card you made. I like the idea of using these colors. Very striking! !